Wednesday 23rd January – Friday 25th January – Tickets: €29 (incl. booking fee). This play shows the ins and outs of a family going through a difficult time. They are three siblings and they have recently lost both their parents. They have got past the initial shock and are starting to deal with the more practical aspects such as what to do with their parents’ belongings! To this end, they have ventured out to a Japanese restaurant to make some decisions on ‘who gets what’. As they go through the list, some home truths and long held grievances are aired as the night slowly falls apart! 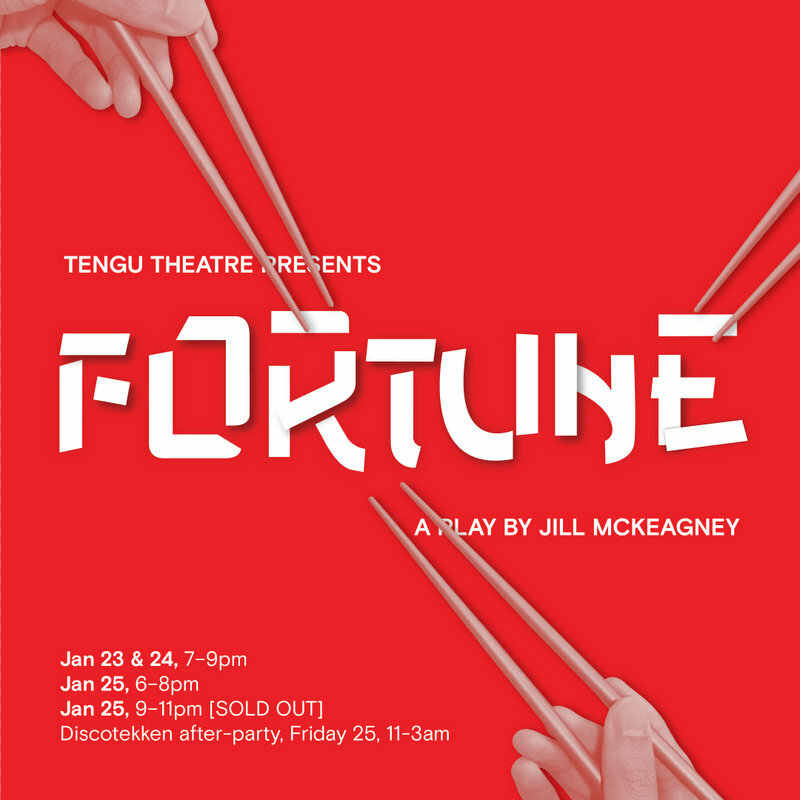 This is a new comedy by Tengu theatre that focuses on the young siblings. The most unusual aspect of this production is that it does not take place in a theatre! 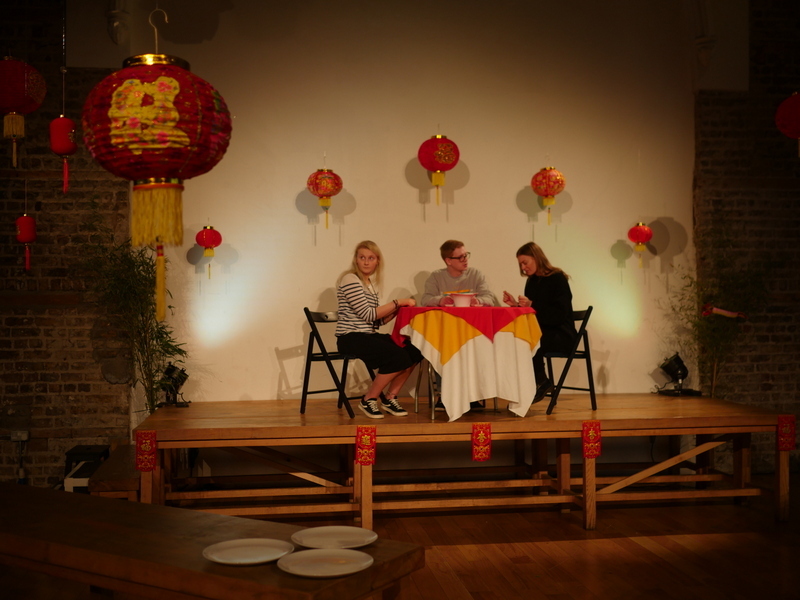 The company have moved the production to a Japanese restaurant to give an air of authenticity to proceedings. The ticket price also comes with a free meal (bentobox) and glass of punch, which does add to the excitement. As with any event that takes place outside a theatre, there are the usual problems of sight lines and hearing the actors, but they surmount most of these. There are microphones on the actors’ table which pick up most of what is said, and the audience is allowed to move to a better spot if they’re struggling to see the performers. This is the second production of the week that started life in the Scene and Heard Festival in Smock Alley and it does seem to be a great springboard for new work. Many plays are presented as works in progress with the hope of returning in a finished state at some point in the future. The festival starts on February 13th, and you can find out more here. The three siblings are well drawn now, we have Michael, the eldest of the three and in some sense the most successful with his job in finance, a successful marriage and two children. The only problem being the rest of the family hate his wife Miriam and see many of his life choices as decidedly dull. Amy is the second oldest of the three, and again is quite successful, but a little more batty. She’s a doctor, but is ‘only a dermatologist’ and may or may not have recently melted someone’s face! The youngest of the three is Eva and she is by far the most deluded. She works in a local fast food restaurant and still lives at home, but seems to think she still has time to become a doctor or a concert pianist! It is a difficult piece for the actors as the conversations are delivered at pace, with the usual quick fire repartee and heated debate often exploding into full blown arguments. There are three main actors in the cast with a few others making brief interruptions. It is the type of production that would bed in well over time, so it’s a pity it doesn’t have a longer run. The main bone of contention for the siblings is definitely the piano, although the Volvo is not far behind! All three want the piano for different reasons and in some cases to annoy the others. The play uses the belongings as a spring board to discuss the lives and loves of the three characters and we hear many snippets and aspects of their lives which we long to hear more about. The characters are well drawn out and multifaceted. You feel you know the siblings and slowly discover their family dynamics over the course of the evening. The theatre company deserve much credit for creating a novel and unique experience.